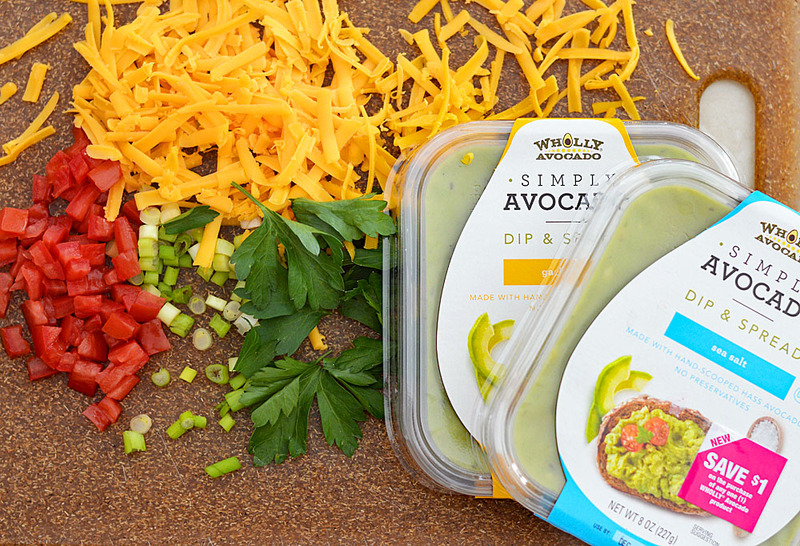 WHOLLY® SIMPLY AVOCADO™ offers the convenience of fresh avocado in the form of a pure, minimally seasoned dip and spread. I absolutely LOVE this product. No more guessing if that avocado is “ready” – we’ve all been there right? SIMPLY AVOCADO™ is made from hand-scooped Hass Avocados with no added preservatives. Choose from either Sea Salt or Garlic Herb. I decided to make a really easy layered dip using SIMPLY AVOCADO™. 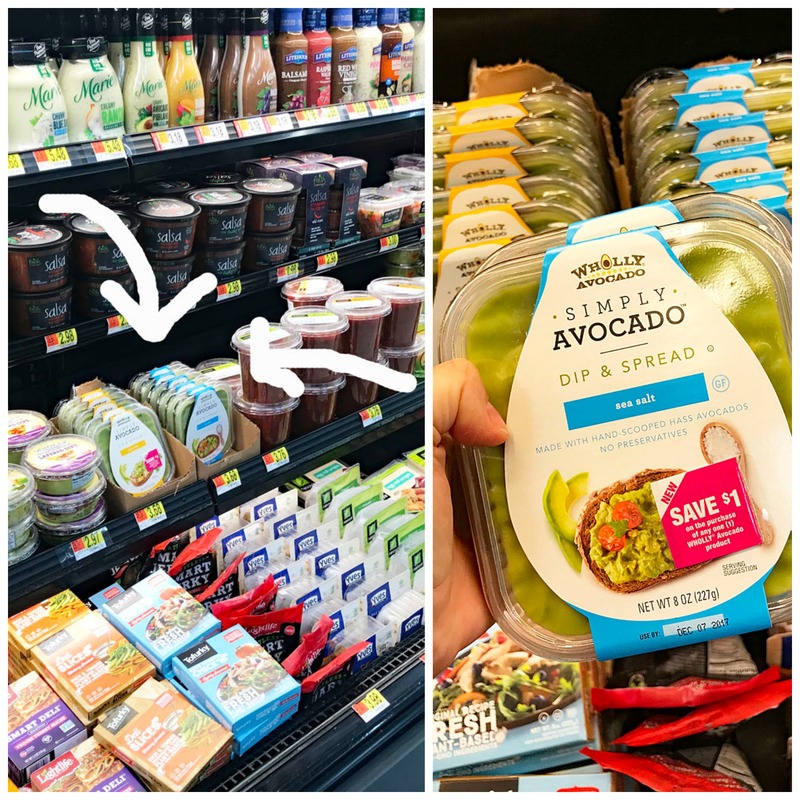 I found SIMPLY AVOCADO™ at my local Scottsdale, AZ Walmart in the condiments section right there in the produce aisle. I decided I wanted to make what are essentially homemade bagel chips, but these are a bit more like bruschetta in many ways. 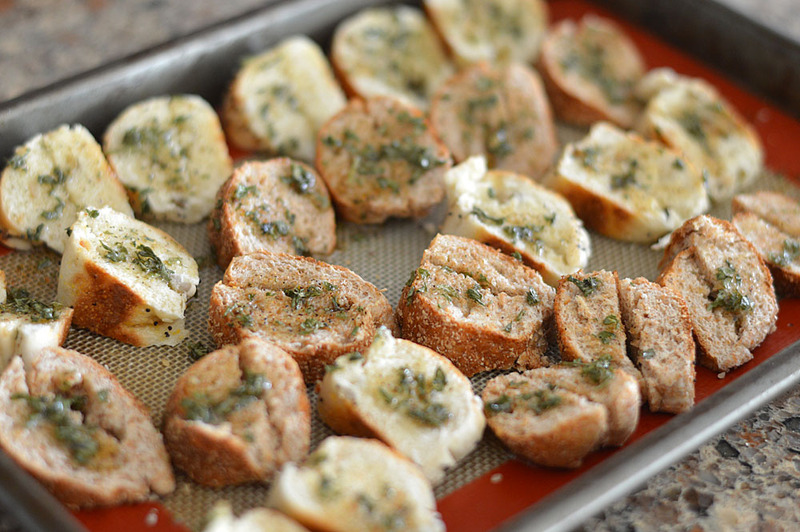 Brushed with an herb-infused olive oil and baked until golden and crisp. Perfect for dipping! Our dip will be topped with diced tomatoes, shredded cheddar (there are great non-dairy options out there), scallions and fresh parsley. 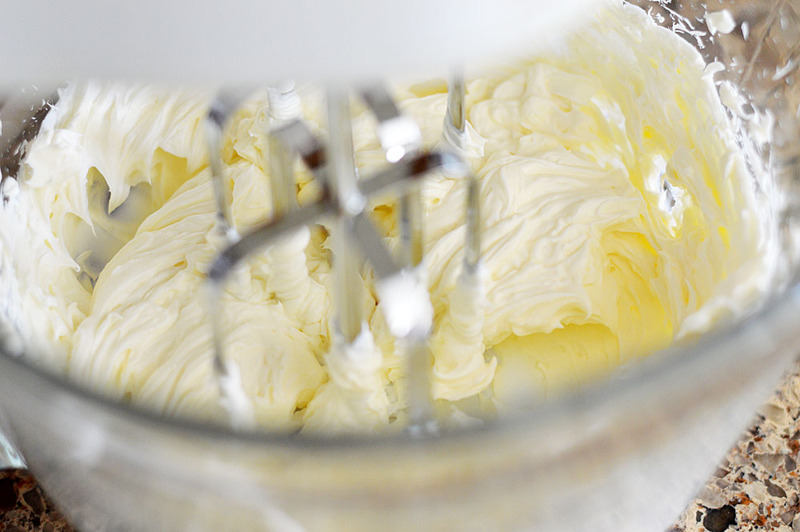 The base of our dip is cream cheese (again, non-dairy options are readily available). 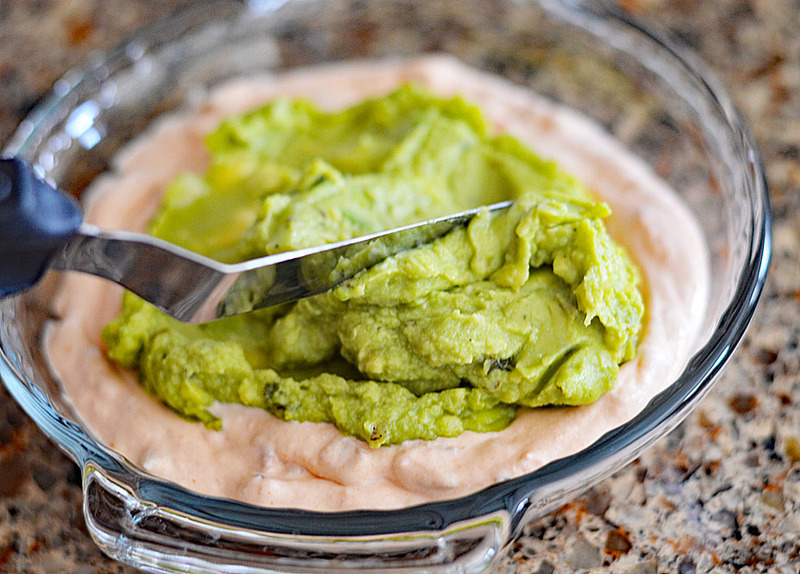 The secret to turning this into a dip, is to whip the cream cheese until it’s light. Then, add your favorite chunky salsa. Top with SIMPLY AVOCADO™ Sea Salt or Garlic Herb (your choice). You could also opt to add ground veggie crumbles here that have been prepared with taco seasoning. Serve with your bagel chips. I like to provide guests with small appetizer plates and knifes for spreading the dip if they wish. You might also consider a serving spoon. I place four of these small glass pie plates with the dip around a large party table and of course, lots of extra bagel chips. Everything is already nice and soft, ready for scooping … but a nice touch would be to heat the dip just enough to melt that cheese. 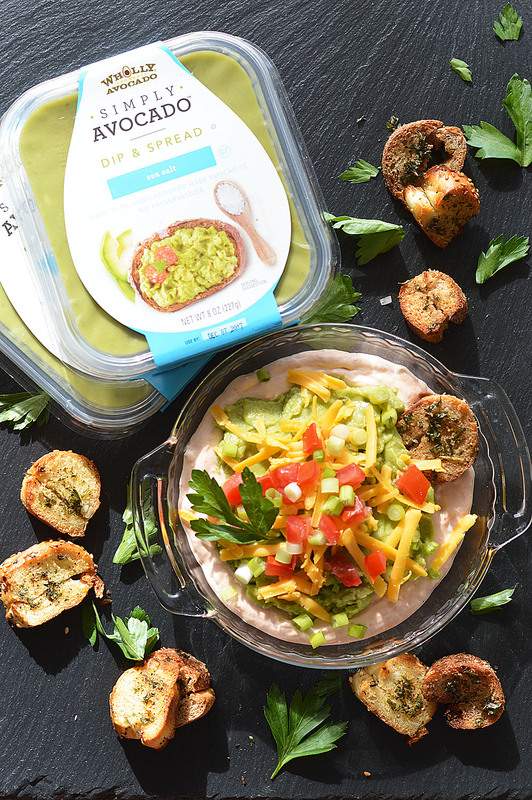 If you are like me and a fan of SIMPLY AVOCADO™, why not connect with them on their social channels such as Facebook, Pinterest, Twitter, Instagram and YouTube? 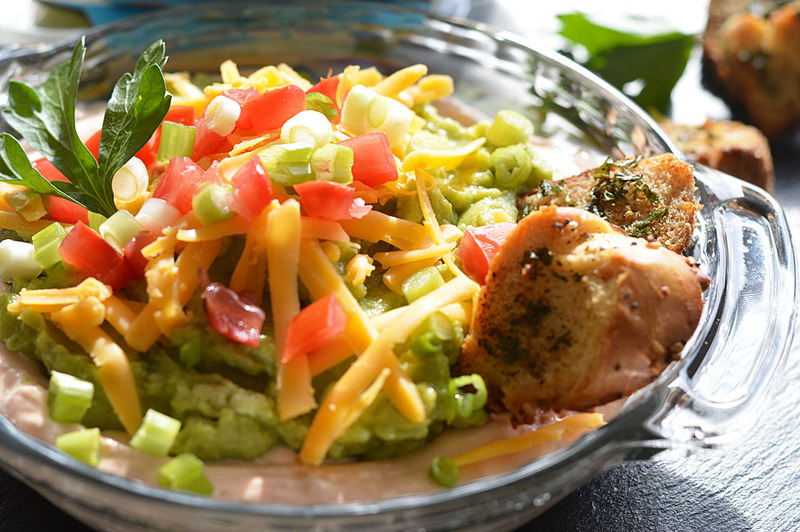 Did you make this recipe for SIMPLY AVOCADO™ Layered Holiday Taco Dip? If so, leave me a note in the comments and let me know what you thought! 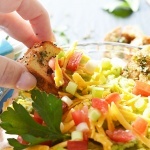 Combine softened cream cheese with chunky salsa using an electric mixer until light and fluffy. 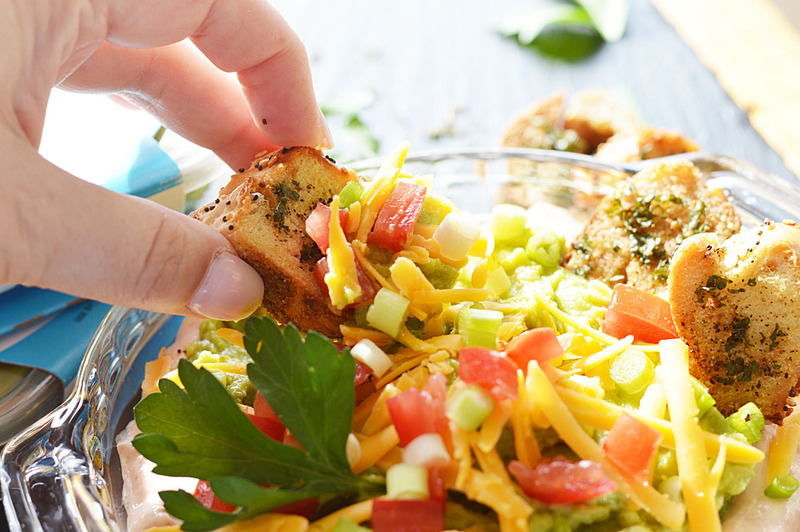 Top with WHOLLY® SIMPLY AVOCADO™, then layer with diced tomatoes, cheese, scallions and parsley. Slice bagels and brush with herb and oil mixture. Bake at 350 degrees until toasted. « Support Small Business This Holiday Season!